Hi! I was wondering where the rug is from? where did you purchase the coral piece? Sofa - Who makes these sofas? I might have it posted, but do you have a site for your furniture Darci? Maker of the blue chairs? Dimensions? "Jessica Charles" company makes a chair that is almost the same as this chair. Artwork - Who is the artist of the piece on the left? A local artist, I commissioned this piece. If you are interested, please contact me. Cottage? - It's a lovely room--bright and cheerful! It would be a great location for my book group!! Is this cottage occupied year round or is it really a vacation cottage? I wonder about keeping a piano without certain conditions being right. It is lived in year round, and the drapery close to protect the piano. Since the photo was taken, we have also added some grass shades for extra protection. It is a wonderful space! What are the dimensions of this room? - I'm wondering how large a room Ned o be o accommodate a baby grand nd a compete setting group. I'm curious as to the size of this room as well! Wall Paint Color - What is the paint color used on the walls? Benjamin Moore's Alabaster is a similar color. It has already been asked but where can I find the rug? - It has already been asked but where can I find the rug? Chairs - Those chair are gorgeous ,where can buy them. Where are the chairs from? Clearly we all want to know!!! Ceiling beams - How far apart are they? Chairs - Please let me know where these chairs are from? Paint color - Do you have the name and brand of the paint color? Thank you! What is the fabric on the orange pillow with a blue ribbon type strip. Rug - Where is rug from? Chairs - Hi, where are the navy chairs from? Can you please tell me where to find the tray on the ottoman? What is the ceiling height of this room at the top beam? HI! Can you tell me where I can find the tape trim on the orange accent pillows? - Thank you! Amazing room! Who made the dining room chairs? 6. Tone it down with persimmon. Faded reds create a softer color palette that still contrasts beautifully with navy. 5. Coral brightens up darker hues. Navy and charcoal gray really come to life when paired with coral. 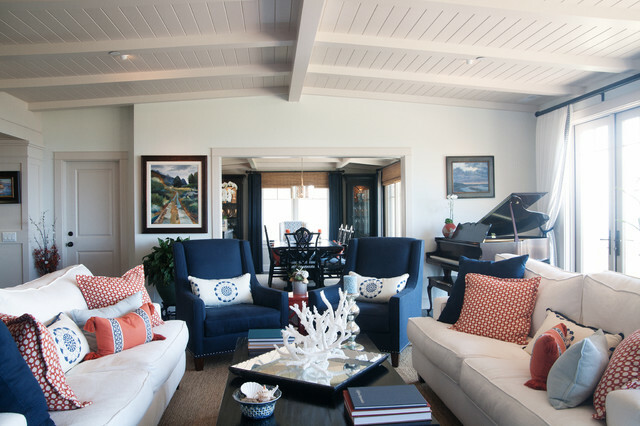 Try adding a few coral throw pillows to a basic blue and white living room for a fresh look.